Saturday morning, despite the snow blowing sideways on our first day of spring (which this found photo does not reflect), I thought I’d go on a little adventure to nowhere fast…. Chicago writer and WBEZ rock star, Amy Krouse Rosenthal, has a new blog: MISSion AMY K.R. I met Amy 5 years ago when she did a signing of her book Encyclopedia of an Ordinary Life at Quimby’s, but I didn’t expect her to remember me or anything. She’s cool. I started reading her blog earlier this year when it launched. Amy’s blog invites us to go on various missions and report back, such as Loose Change The World. I will now publicly admit my lapsed following of the blog. But thanks to an announcement Friday afternoon on Chicago Public Radio, I learned about the latest mission: Go Nowhere Fast…Together. Spring out of bed on the first day of Spring and meet at the Belmont El station at 9:45 AM. We bring our coffee, she’ll bring the donuts. 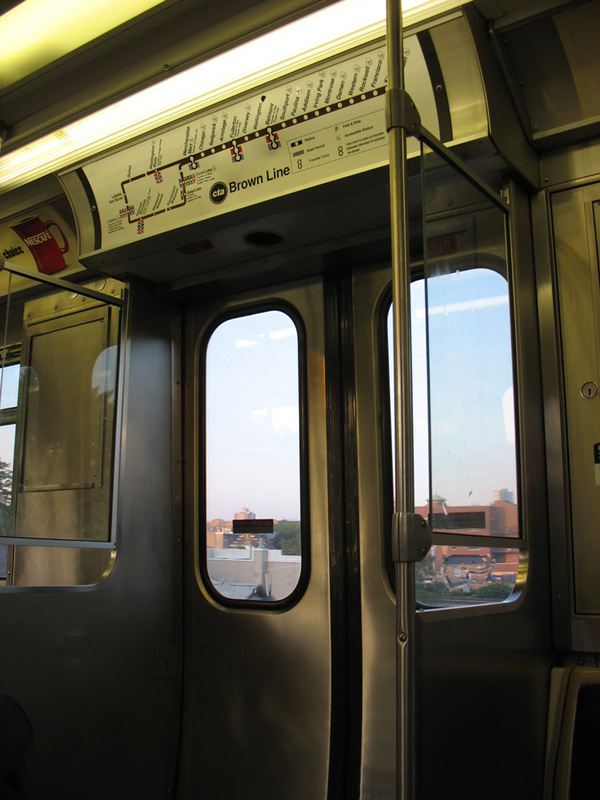 We’ll ride the Brown Line together, down to the Loop and back. We’ll eat our donuts, we’ll be together. We’ll do…other things? Cool. Sounded like a fun thing to do–a little random, a little artsy, a little silly, enlightening, philosophical, brilliant. The kind of thing I’d do in high school or college and people might be like What? It’s slam dancing with my friends to Nine Inch Nails at the school dance where everyone else just stared at us in a time when “alternative” still meant something. The kind of thing that goes beyond cool and gives our worlds a little shake. Otherwise, my Saturday morning with Ernie out of town would’ve consisted of my waking up eventually, making coffee (which I did, and travel cupped), probably pancakes, and living in my head till work. Not there’s anything wrong with that. But sometimes a little assertiveness and bubble bursting goes a long way. We paid our fares and gathered on the other side of the turnstiles. Since Amy doesn’t like name tags (we learned), she passed out Post-It notes and pencils. Cool idea, but I was nervous about the not-always-reliable Post-It sticking to a snow-soaked fuzzy winter coat. Some folks had more resources to work with such as safety pins and jacket strings and zippers. I was traveling light and had to throw caution to the adhesive. Brushed off the melted snow as best as I could and stuck my square note with “Michael” and a Smiley Face to my coat. It worked for a while, but it fell off a couple times on the train while balancing–my donut, my coffee, myself. Not that my address and social security number were on it or anything, but I was a little creeped out about having it lying around a CTA train car. So into my pocket it went after a while. My traveling companion, Dooney, used the safety pin that fastened the size tag inside his hat. He’s like I know what size my hat is: the size of my head! So, “Dooney” what’s that all about? A nickname he acquired in college as folks said his profile makes him look like a Doonesbury comic. Time to head up the stairs to the platform, someone behind us commented she felt like cattle. I hear that, but it was this well balanced blend of both active participation and being lead. We moved far down to the left where the front car was presumably to stop. The idea was always to gather in the front car. Alas, we were slightly thwarted when the train stopped short of where many of us stood. But we all made it on in one piece. There was a smattering of riders already there, but there was room for all of us. Some sat, but most of us stood. Dooney, myself, and a handful of others, including producer Justin’s little one and his friend, gathered at the very end of the car, just behind the operator’s–let’s call it a cubby. The cockpit? Sure. 🙂 On the far end of the crowd (maybe 50 people?? ), I noticed Steve Edwards and Tony Sarabia and swooned just a little in nerdy-gay-public-radio-fanboy-ness. Donuts were passed. First, the box of Munchkins made the rounds. Chocolate please! Then Justin passed the big boxes. I’d requested Boston Creme on the blog (as had many), so snatched one up. Yum! Thankfully, Justin also had napkins. With all the jostling of the train, things were bound to get sticky. At one point I thought we were getting kicked out as we’d definitely broken the No Eating aboard CTA trains rule. But whatever, people do it all the time. But perhaps not in such an organized fashion. The operator stepped off the train for a few. Slightly nervous, but we carried on our adventure. Amy’s perch was one of the side facing benches to talk to us. She thanked us for coming and posed this question to us: So, Where Do You Go From Here? Could be literal: I’m going home to take a nap, etc. Or a little more figurative and philosophical, In Life and all that. Well, the literal thing I’d thought was to go take that nap before work. The Life thing was to re-emphasize my battle plan to curb my Writerly A.D.D. and focus on something for longer stretches of time. (I realize in writing this, I’m not focusing on the current focused project, but , well, it’s important and I am master of my fate and all that.) Justin went around with his camera and asked us to share our answers. We’ll see if Dooney and I make the video cut. The riders who were already on the train at Belmont and those we picked up along the way had mixed reactions. From ignoring us, to positive curiosity and participation (one rider we picked up who got off downtown answered Amy’s question for Justin’s camera) all the way to definite grumpiness. Dooney was like Some of these folks are not happy and I was like Well, that’s their problem that their souls and lives are lacking in joy and excitement and all that. Not direct quotes, but that’s basically what I was saying. Those grumpy people were not embracing this experience that we, Amy, and the fates had bestowed onto them. And that’s a little sad. But I can understand that grumpiness too. At 35, I can slip into “grumpy old man” status. Just ask my husband. 😛 But one guy who came on, probably in his 50’s, we offered him a donut and he was like Well, I’m a Chicago Public Radio member, so I think I will have one! An unexpected Thank You gift. Tastes better than a tote bag. Amy’s pal, Nick, brought his ukulele, and we had a sing-along. First, we sang the Beatles’ “I Wanna Hold Your Hand.” And by “we” I mean that I sort of hummed and sort of vocalized a few words all while tapping my foot and singing in full glory in silence inside my head. Singing in public (and by public, I mean in front of anyone, anywhere, is not my thing, unless I’m cast in a musical where I’m basically glorified stage dressing anyway) is not really my thing. I’m a wicked mouther, though. Just like I play all the instruments in my air band. Anyway. Then, one of the guys Dooney and I were hanging out with (whose name I’m blanking on) requested George Michael’s “Faith.” He helped Nick with the chords and off we went. Pretty awesome. I helped with the “Baby!” Guess I’m more George Michael than George Harrison. As our trip drew to a close, we passed around sticks of chalk to write something somewhere, something we know won’t stay there forever. I took a piece, broke it in half, and gave my other half to Justin’s little boy–who started to draw on the window with it. Cute! I still have my chalk in my coat pocket, but haven’t written my message yet. Thought I’d wait till at least the snow melted. I’ve spent most of my time at work since out adventure (even working a shift between writing all this.) But I will use my chalk. Promise. The train windows were fogged up most of the trip, so I couldn’t always tell where exactly we were. The announcements helped, but we were all focused on each other. The togetherness was the main attraction. When we hit Fullerton on the way back, I momentarily forgot that the Brown Line stops a couple times before Belmont. I’ve been more of a Red Line kind of guy during my tenure here. I panicked for a moment that our trip was ending too suddenly. I like some sort of closure to things. It’s why it takes me forever to leave a party. Before getting off the train, I asked Dooney what he had going on after all this and to see if he wanted to grab a bite. Our fellow travelers dispersed and walked down the stairs in much less herd of cattle fashion. Dooney and I went over to Clarke’s. Breakfast beyond donuts sounded really good. And more coffee. Not that I needed it, but I definitely wanted it. At one point on the train, I saw one of the girls near us, Jennifer, she’d stuck her Post-It note on her travel coffee cup. Why didn’t I think of that?! So I dug mine out of my pocket and stuck it there–and there it stayed for a while with a little help from strategically placed fingers. At one point, sitting in our booth at Clarke’s, I noticed my name tag was gone, fallen somewhere on the street. This didn’t bother me as much. My name and a smiley face are out there for someone to find. Since I haven’t chalked my message yet, that will have to do for now. Dooney and I had cool snowy-day-in-a-diner conversation sharing stories and life. We’re both theatre types and it makes sense we have at least a few Facebook friends in common. We’ve both been to Australia. This week’s Mission is to post thoughts on the trip. Which all this is. Amy asked a few prompts, including, Did you make a new friend. I’d say Yes. So, Yay. Everything starts somewhere. None of the snapshots I took are really any good, so I found this Brown Line map that somewhat shows Where We Went, though it doesn’t really do the journey justice. There are some visual aids over at Amy’s blog. As to Where I Go From Here on this Tuesday morning, finally finishing this, it looks to be a day of little accomplishments (this!). Maybe some big ones too. Break-throughs can happen when you’re not really thinking about it.